It has been uncharacteristically dry and cold here in the Pacific Northwest for the past two weeks. Low freezing fog has clung to the tree tops, leaving behind it's icy stain. Cold feet rule the day and I realized with some shame, that I had not hung bird feeders for our feathered friends since moving to this house in the late summer. 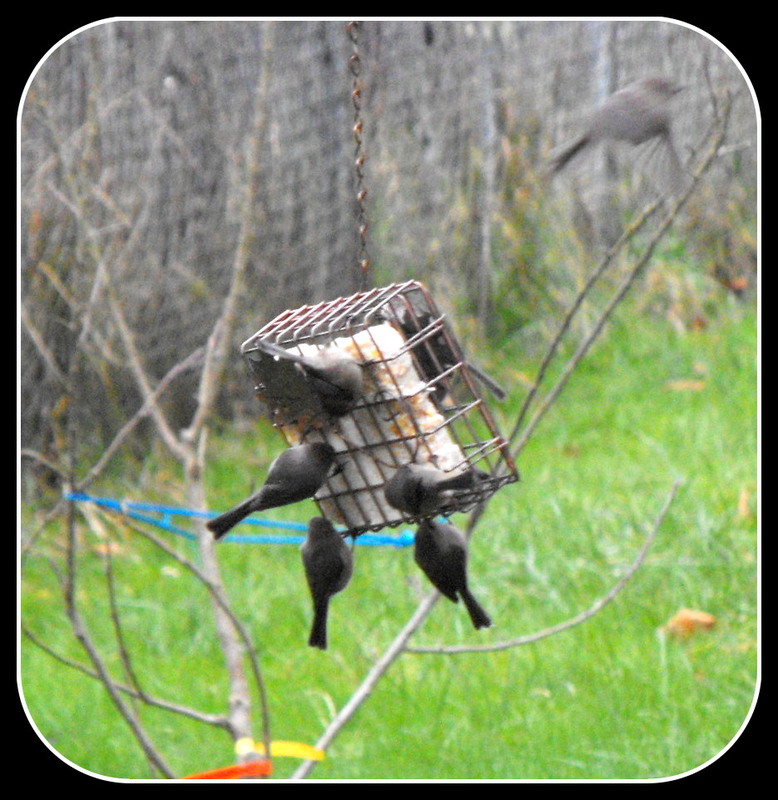 It did not take long for the local winged crew to find my feeders. The kids and I have enjoyed spying out our dining room window to see what types of birds are visiting. 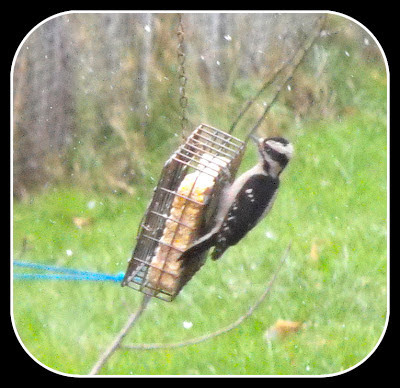 So far we have identified a Downy Woodpecker, a Hairy Woodpecker, Chestnut Backed Chickadee's, Black Capped Chickadee's, Red Breasted Nuthatches, Junco's, Steller Jay's, Scrub Jay's, Bushtits, Winter Wrens and a Northern Flicker who is quite greedy. Soon, the fog soup will disappear to be replaced with our normal, rainy, gray days we so *enjoy* here. These cold days will test many of the zone-stretching plants that I have acquired. It will be sad if I lose some (but it's always fun to replace). For those of you in the Portland Area, I've created a page dedicated to upcoming plant sales. Some of these might be worthy of a drive south for my Seattle area blogging friends! The Portland Yard Garden & Patio show will be coming soon. I know I'm ready to hit the show and seminars! It's always fun to watch the birds eat! I'm glad you remembered to hang feeders finally at your new house. Loree at danger garden has invited me down to the Portland Bloggers plant swap this spring, so if you go to that I might get to meet you! I doubt I'll be down for any of the plant sales, or for the PYGPS. Although you never know, some future year I may make it to that! It's always interesting to see what birds you have that are so different to ours and yet recognisable as from a similar family of birds. It IS very cold and we have been feeding the birds, too. So far we have chickadees, jays, a sparrow and two--- squirrels. It just hit 36 degrees. I'm goin' out! What a coincidence that your post should start with a Woodpecker. Today I have been watching a Green Woodpecker (in the snow). Unfortunately I do not have a camera lens capable of capturing a bird at that distance - about 100 feet. I'm surprised to hear you writing about dry conditions. Here we have snow, which is fairly rare for the SE of England too. The birds don't hold a grudge, they'll go wherever the food is! I always fill them up on friday so that they will congregate saturday morning and I can enjoy them with breakfast and coffee. I planted some new stuff late this year, so I am hoping the cold weather doesn't discourage them too much and decide not to live any longer. I'll be watching the plant sales. I remember a big one you went to last year and think i'll try to schedule an outing when it comes back around. The Tacoma Home and Garden show is this weekend so I'll be stopping by and hoping to find some good deals or plants! IG - I love your idea! Great Saturday morning entertainment! Hope you are able to make some plant shows ~ I am really looking forward to some of them this spring! I find watching birds quite therapeutic and enjoyable. They are all so beautiful. 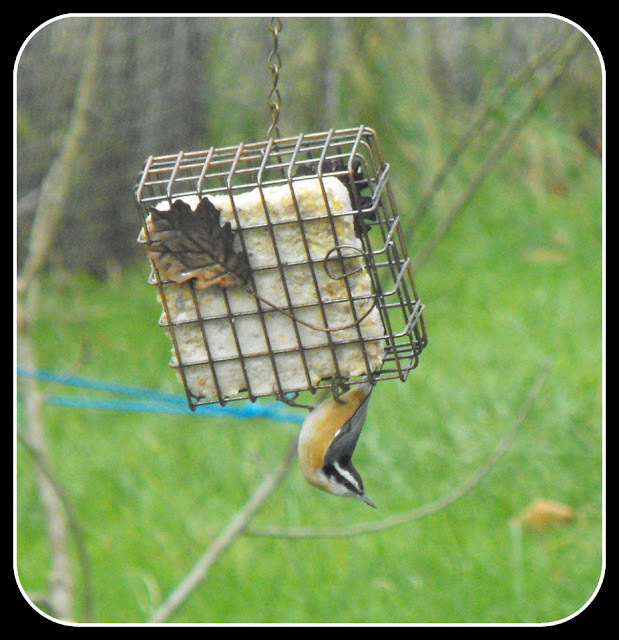 Your nuthatch photo is really cute. Hi Kelli, that little nuthatch is becoming a favorite. They are such little characters bopping around and striking strange poses! Love to watch the birds, it's helped me through many a winter - a theme amongst gardeners I think. Our yard doesn't get quite as many visitors when I'm watching, although there is a bird that flits around the outside edge and I've not been able to positively id it - a towhead or a grosbeak. Hi Barb, I've been surprised by the amount of woodland birds that have come to visit my feeder and we are in a granted, older, established, but still suburban neighborhood. You're doing something right. The feathered friends are sure enjoying your offerings. Nice photos. I'm so ready to be done with this fog. It cleared yesterday for awhile then returned this morning. NO. Oh well. So ready for spring. Ah so good to see the birds...and yes I know gloomy and wet. But remember you will be rewarded with spring much sooner then us. Do you get many different types of birds at your new house? It seems like they have all found you! We had that crazy freezing fog for about a week, then pouring rain for another week and today the sun came out, it was so nice. I hope you got some there too. I will check out your plant sale page. I'm looking for an excuse to head down to Portland again.